Pains Wessex has been a leading supplier of marine distress signals for over 100 years. When you specify lifesaving equipment for your vessel, you need to know beyond any doubt that it is the most reliable and cost-effective available. 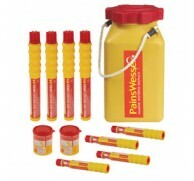 With Pains Wessex advanced pyrotechnic marine distress signals, you can be sure you have made the right choice. Mount Batten Warehouse Due to currant regulations, Flares are always shipped separately from other items on the same order. Flare orders will be charged at 18.60 GBP. We can not guarantee next day delivery on these products.